Here's my solution to the fact that the ADV side boxes aren't as large as some others. It's for one-up riding only but that's what I do. Lrobby99, thirdofthree, ptcaflyer and 3 others like this. I'd say that's a great idea, down low and waterproof. How are they fastened to the bike? Those are bicycle panniers, actually. Ortleib has a really wonderful mounting system on their panniers that lets them just hook on and off instantly. I mounted three footman loops to the front sides of the boxes. These bags are from their new Gravel Pack line. Very similar to their other bags but lighter and with tougher fabric. thirdofthree, eagleeye and Umbrianissimo like this. Last edited by Ripshod; 04-17-2019 at 10:42 AM. 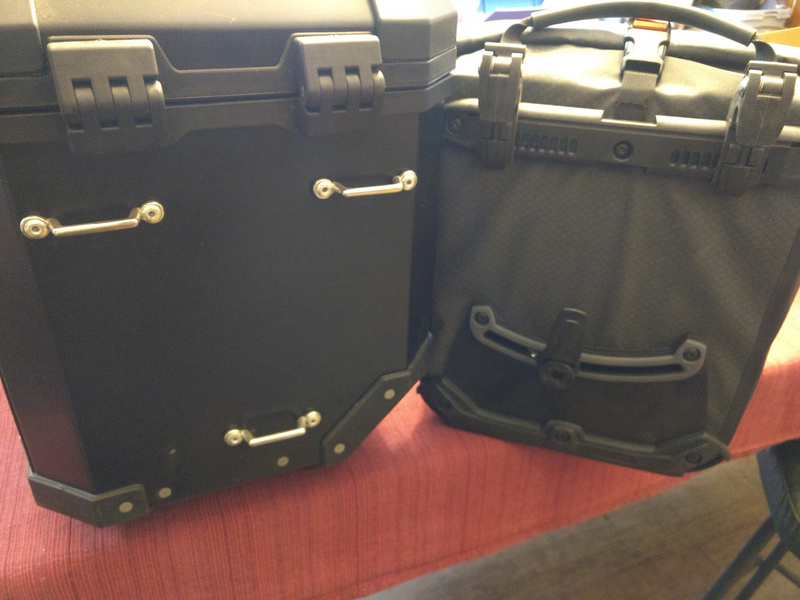 Not sure I'll ever use them now that I have the big 60L bag for the back seat. Maybe if I ever ride 2 up. I have a knack for finding off-label uses for gear. Like tank panniers, for instance. Since I always ride one-up, I see that space behind my heels as a place where more cargo can fit. I've also used Ortlieb bicycle panniers on other bikes. The mounting system is just too good. Big B, notacop, Spec and 5 others like this. Just what was it you didn't want to leave behind when you ran away from home? VstromGrin and Inpitt/Mac50 like this. Yeah, I carry a lot of gear. I'm old and it takes that much stuff to keep me comfortable. The idea is to build camp, dump all the gear, and go ride. Meanwhile back at camp, I have a comfortable place to sit, cook etc. in the dry no matter what comes. 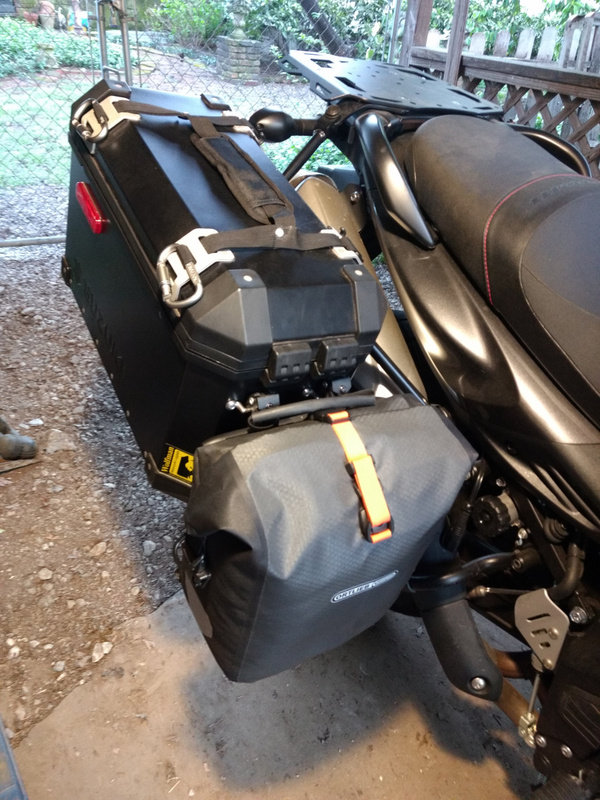 I've changed rear bags but essentially I'm still carrying it all on the Strom. And yes, there is a kitchen sink in there but I don't think you can see it from here. You've heard of minimalist camping? Well, I'm a maximalist. Big B, Spec, bhavinjo and 6 others like this. Last edited by Ripshod; 04-11-2019 at 11:50 AM. If I had to take all that stuff with me I'd just take a U-haul. 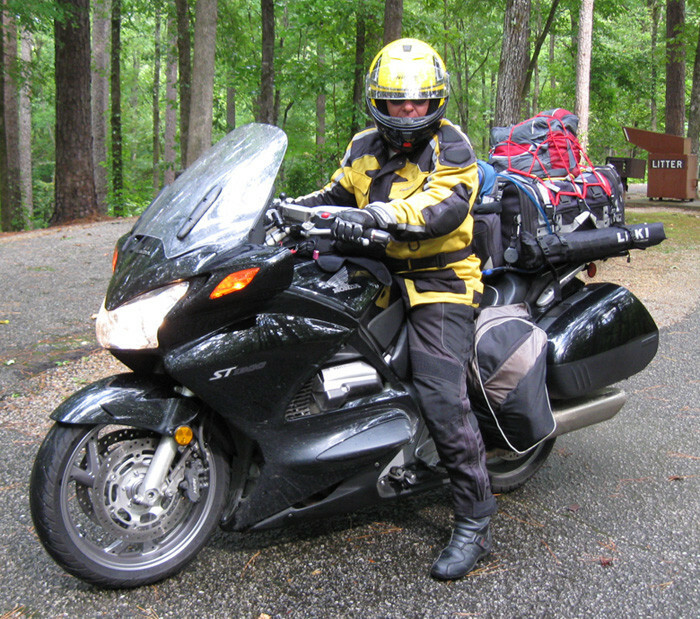 One of the things I like about motorcycle travel is less is more. If it doesn't fit in the 3 panniers or less I don't need it. Well, that's one difference between you and me. I've been traveling like this for sixteen years. I've taken this setup on various bikes three times to the west coast, three times into Canada, and most points in between. I set up a very comfortable place to live and I live there for a few days. It's all worth it s far as I'm concerned. And as far as the weight is concerned, it's all comparable to the average-sized wife. And it's a lot quieter. In other words, I don't have to. I want to. Big B, notacop, thirdofthree and 14 others like this.